I am a Visiting Assistant Professor of Political Science in the School of Public and International Affairs at the University of Bridgeport. I have over a decade of experience teaching political science and taught at UCLA, Pepperdine University, Loyola Marymount University (Los Angeles), and Franklin & Marshall College. As of Fall, 2019, I will be an Assistant Professor of Political Science at the University of Bridgeport. My new research agenda on gender politics has been published in the following peer-reviewed journals: Politics, Groups, and Identities; Journal of Women, Politics & Policy; US-Japan Women’s Journal; Representation; Women’s Studies International Forum; and the International Journal of Politics, Culture, and Society. My commentary has appeared in The Asahi Shimbun, The Japan Times, WBEZ Chicago/NPR, Channel News Asia, CBS, World Politics Review, and other media outlets. I have been an invited speaker at Yale University, Johns Hopkins University, the University of Pennsylvania, the University of Zurich, Ochanomizu University, and Haverford College. I am a member of the Maureen and Mike Mansfield Foundation’s, US-Japan Network for the Future (Cohort II), which is focused on addressing the most urgent security and policy challenges facing the alliance and the Asia Pacific region. In June of 2019, I will participate in the Bridging the Divide Program which is jointly organized by The Korea Foundation and the Maureen and Mike Mansfield Foundation, and brings together Asia experts and policymakers in Seoul, South Korea. 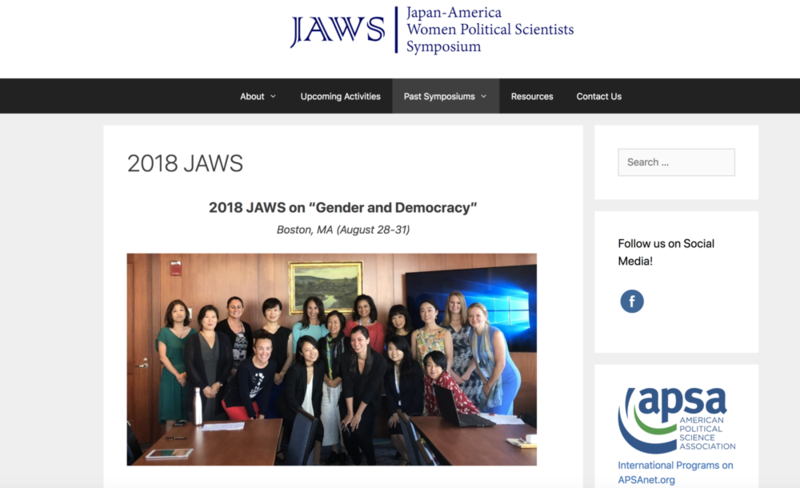 Service to the profession includes co-organizing the 2018 Japan America Women Political Scientists Symposium (JAWS) for the American Political Science Association and supporting initiatives to mentor women and minorities in the discipline. At previous institutions, I founded groups for minority and first generation students and faculty, and I have dedicated my career to promoting equity, representation, and inclusion in higher education.